01:10:00 Makes 24 servings, one cupcake (78 g) each. Makes 24 servings, one cupcake (78 g) each. Trick or treat? This Ghost "Cake" is both - it might look like a cake but it’s actually an artful arrangement of vanilla cupcakes. Prepare cake batter as directed on package. Add dry pudding mix; mix well. Spoon evenly into 24 paper-lined muffin cups. Bake as directed on package for cupcakes. Remove to wire racks; cool completely. 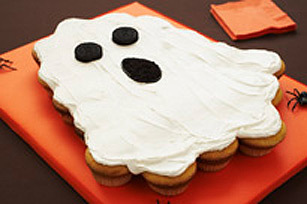 Arrange cupcakes on large serving platter or tray to resemble a ghost; spread with frosting. Use decorating gel to outline the mouth on the cupcakes. Finely crush 3 of the cookies; sprinkle inside mouth. Place remaining 2 cookies on cupcakes for the eyes. Store in refrigerator. Serving Size Makes 24 servings, one cupcake (78 g) each.